"Remember in the Lord those who gave their lives in the Second World War. "In my Father's house there are many mansions". Of the 20 casualties, 19 were men and 1 was a woman (LACW Elizabeth Cowan). The following details have been supplied by Mr Stuart Nicholson, Archivist for the Parish of Whitehaven (Church of England). It has been used with permission. The modern Parish of Whitehaven covers four previously separate Church of England Parishes of Whitehaven - the parishes of St James, St Nicholas, Holy Trinity and Christ Church. 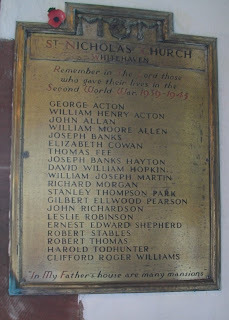 The following WW2 casualties were connected to St Nicholas' Parish Church. Able Seaman George Acton (a Merchant Navy Seaman) died on the SS Empire Leopard on 2nd November 1942, aged 23. He is commemorated on Panel 43 of the Tower Hill Memorial, London. The letter to his mother, Evelyn, confirming his presumed death was dated 19th May 1943. The Empire Leopard was carrying 7,410 tons of Zinc Concentrates and Munitions, and was one of 45 merchant ships in Convoy SC-107. This convoy was intercepted by the German 'Wolf pack' Vielchen [Violet] pack and sunk by the German submarine U-402 commanded by Siegfied von Forstner. At 08.03 SS Empire Leopard was sunk in oceanic waters 500 miles north east of Belle Isle at position 52o26’N 45o22’W. Of the crew of 35 merchant men and seven gunners just 3 men survived. They were rescued by the Stockport and landed in Reykjavik, Iceland on 8th November. The convoy had sailed on 24th October 1942 from Botwood, Newfoundland via St. Johns bound for Belfast, Avonmouth and Liverpool on 30th October. She had been built in 1917 as the USS West Haven, and had also been known as the West Flame, the Marian Otis Chandler, and the Onomea, and had a grt of 5,520. George Acton was one of the sons of John and Evelyn Acton (nee Walker). He was one of 4 Whitehaven men killed in this incident - see also William Henry Acton below. The other two (not on any Parish of Whitehaven memorial) were William Scott Truett, (aged 22 of Solway Road) and Thomas William Walters Cradduck (married with 5 children and aged 41, of Marlborough Street). George lived at 93 George Street. George Acton is also commemorated on the family gravestone 5 / J / 44 in Whitehaven Cemetery. John Acton died on 17th December 1945 aged 77 and Evelyn (Lena) on 12th October 1956 aged 79. Able Seaman William (known as Billy) Henry Acton (a Merchant Navy Seaman) died on the SS Empire Leopard on 2nd November 1942, aged 27. He is commemorated on Panel 43 of the Tower Hill Memorial, London. William Henry Acton was baptised on 3rd October 1915 at Holy Trinity Church, and married Mary Nulty at St. Nicholas on 10th August 1942. They lived at 51 Church Street. He was the third son of John and Evelyn Acton (nee Walker) of George Street. A cousin of George and Billy, Abraham Acton, won the Victoria Cross in the Great War. He was subsequently killed, and is on all the Anglican War Memorials of Whitehaven. None of the three Actons has a known grave. Billy Acton is also commemorated on the family gravestone 5 / J / 44 in Whitehaven Cemetery. John Acton died on 17th December 1945 aged 77 and Evelyn (Lena) on 12th October 1956 aged 79. Sergeant John Allan (3598633) of the 1st Airborne Division, Border Regiment died on 22nd September 1944, at the Battle of Arnhem aged 34. He is buried in grave 16 A 4 at Arnhem Oosterbeek War Cemetery, where around 1,680 men are buried. He was originally given a battlefield burial at the place where he died- in front of the Hotel Tafelberg, Oosterbeek. In Military records the surname is spelt Allen, although Allan to the CWGC. The family advise that Allen is the correct spelling, and that the DSC (an American decoration) attributed to him by the CWGC is incorrect. There is an American of the same name who was awarded the DSC. (This information was passed on by Major Ray Devlin, Secretary, Cumbria Parachute Regiment Association). John Allan was the husband of Florence Ruth Allan (nee Smurthwaite), who he had married at St. Nicholas on 24th December 1938. They had two children - William (born 11th October 1940 and baptised at St.Nicholas on 6th November 1940) and Ann Marie (born 24th August 1942 and baptised on 16th September 1942). Both children went to Irish Street Infants School. They lived at Scotch Street. (The Borough Roll of Honour incorrectly spells his name as Alan). Florence Ruth’s mother was Mary Jane Smurthwaite (nee Deacon), and her father was a miner George Robert Smurthwaite, of 144 Queen Street. John's father was also a miner, William, of 27 Queen Street. John Allan's brother-in-law, George Robert Smurthwaite (Jnr), was a WW1 casualty and is commemorated on the St Janes' Parish Church WW1 War Memorial (No 170). Sergeant William Moore Allen (T/61417) of the 58th Division Troops Company Royal Army Service Corps died on 18th June 1944, aged 31, during the Battle of Normandy. He is buried in Grave XIV H 16 at Bayeux War Cemetery, France. He was the son of Andrew and Edith Allen, and lived at Rosemary Gardens, Whitehaven. Sergeant Banks (1091782) of the 83 Squadron, Royal Air Force Volunteer Reserve, died on 3rd January 1944, aged 22. He is buried in Collective Grave 6A 18 to 23 at the Berlin 1939 to 1945 War Cemetery. He was the son of Joseph & Elizabeth Swan Banks, and lived at 48 The Gardens, Coach Road. Leading Aircraftwoman Elizabeth Cowan, or Betty as she was known (Service No. 2096437) served with the Women’s Auxiliary Air Force. She died from bomb blast injuries on 24th October 1945, aged 30 and was buried in Whitehaven Cemetery Grave 5/J/62 on 29th October 1945, from 10 Countess Terrace, Bransty by the Vicar of Hensingham St. John. Betty was one of the daughters of Walter John and Elizabeth Cowan from the Bransty district of the town. She was baptised at St. Nicholas on 28th March 1915. Betty’s sister Margaret (baptised at St. Nicholas on 16th November 1913) had tried to sign up at the same time, but failed a medical so she stayed in the town, working for the local newspaper, ‘The Whitehaven News’. Elizabeth Cowan was omitted from the Borough Roll of Honour. Sergeant (Pilot) Thomas Fee, known as Tom, (Service No 1527088) was serving with 101 Squadron of the Royal Air Force Volunteer Reserve at the time he died on 13th April 1943, aged 32. He was buried in grave 5J50 at Whitehaven Cemetery on 17th April. He had trained as a Pilot in California, and had been serving at Holme-in-Spalding at the time of his death. In 1934 Thomas was a bricklayer, but later in that decade he became a self employed builder and contractor, with a high reputation. At the time of his death there were well advanced plans for him to speak at the Borough ‘Wings for Victory’ week later in 1943. He had married Mabel Dawson (21) at St. Nicholas on 27th July 1931. By then his father (a miner) was deceased, as was Mabel’s father (still alive). The family home had been 103 Duke Street. Thomas and Mabel set up home initially at 2, Lonsdale Street, Bransty. Their first daughter, Jean, was born there on 30th June 1934 (baptised at St. Nicholas on 25th July). By the time their second daughter, Dorothy, was born on 4th April 1942 (baptised at St. Nicholas on 16th August) they were at 4 Duke Street. By 1947 Dorothy was at St. James Infants School. Dorothy has a stone below Thomas’s. She subsequently married a Mr Taylor, and became Dorothy Fee Taylor. She died in 2003. Wireless Operator/Air Gunner Sergeant Hayton (1119824) of the Royal Air Force Volunteer Reserve died at 02:28 on 17th November 1943, aged 34. He was buried at Harrington at 2pm on Saturday 20th November 1943. Local newspaper reports state that he was the son of Mrs Howie - see below for an explanation of this. At around 22:50 on November 16th 1943 Wellington Ic Z8799 of 28 OTU RAF Wymeswold (near Loughborough) with a satellite airfield at Castle Donnington took off for a night navigation exercise and crashed on Anglezarke Moor, above Horwich killing all six crew. About four hours into the flight thick ice had formed on the airframe. This led to a loss of control, with the plane going into a steep dive precipitating structural failure and break up. In the last moments the dinghy came free from its storage compartment aft of the port engine and became entangled in the tail- thus dooming any chance of averting disaster. A memorial was erected in June 1955 by Horwich Rotary Club, near the footpath once trodden by lead miners on their way to Clough. This is very near the crash site, but in an accessible location. Regrettably it incorrectly gives the date as 12th November. He had joined the Air Force in 1941 and had only recently returned from 18 months in Africa. Previously he had been an agent for the Britannic Insurance Company. Although on the St. Nicholas Memorial he was buried at Harrington (St. Mary) Churchyard in the tenth grave from the East on the NE wall. The churchyard was subsequently remodelled and the original gravestone lost. There is therefore now a CWGC stone in the North East Corner of the old Churchyard (very close to his grave) to himself and an R.CF. [Robert Coventry] Blair (South Lancs. Regiment died 8th May 1919), which states that they are buried elsewhere in this churchyard. From the family gravestone at St. Bees this is known to be in the family vault for Private Blair. Gunner Hayton is on the St. Nicholas Memorial because his mother was living at 83 George Street at the date of death. On the Borough Roll of Honour he is incorrectly spelt as Heyton. The CWGC listings incorrectly state that his parents were Amos and Arm Hayton - that should read Amos and Ann. Amos Hayton and Ann Banks married at Moresby in 1898. Amos died in 1909, and was buried there in grave 136 on 30th March. Ann Hayton then remarried a widower (miner) William Howie at Harrington on 11th May 1912, when he was aged 47. She lived at 9 West Row, Lowca and he at 10 West Row. William then died and was buried at Moresby in grave 227 on 6th February 1913. Ann remained a widow for the rest of her life and died at 93 Queen Street, aged 75. She was buried at Moresby on 16th June 1949 and is buried in grave South XV 26. Joseph was baptised privately by Moresby Church on 30th March 1909, when the family were living at Lowca Cottage. As the birth was registered in the June quarter this was probably also his date of birth. The other members of the crew who were lost were Pilot Flt Sgt J. Timperon, Co-Pilot Sgt E.R. Barnes, W.Op/Gunner Sgt R.S. Jackson, Navigator Sgt G.E. Murray, Air Gunner Sgt M. Mouncey. Lance Corporal David W. Hopkin (Service No 3709228) of the Royal Corps of Military Police died on 8th June 1941, aged 33. He is buried in Grave XXIX J 21 at El Alamein War Cemetery. He was the son of Ebenezer and Elizabeth Hopkin. He lived at 8 Windermere Road, Woodhouse, Whitehaven. Gunner Martin William J. (852437) of 51 (The Westmorland and Cumberland Yeomanry) Field Regiment of the Royal Artillery, died on 16th June 1943, age unknown. He is now buried in Grave I G 8 at Ranchi War Cemetery, India. Ranchi is primarily a concentration cemetery from numerous smaller ones, and 705 men are interred here. It is 419 km North West of Calcutta. He was then serving with 203rd Field Battery, 51st Field Regiment. He was the son of Nicholas and Mary Isabella Martin. He lived at 46 Bransty Road. He had a brother (Nicholas). Able Seaman Richard Morgan (Service No P/JX 26800) was serving at HMS President III, Royal Navy when he died on 19th April 1946 aged 25. He was buried on 23rd April 1946 (from 71 Bransty Row) in Grave 5 / H / 115 at Whitehaven Cemetery. The headstone is a private one, not a CWGC white one. He is not on the Borough Roll of Honour. HMS President III was a land facility, not a ship, and was the headquarters for personnel serving on defensively equipped merchant vessels. He was the son of Margaret Morgan who had died on 7th December 1924, aged 27. She was the daughter of Richard & Isobel Coward. Margaret Coward had married Moody Morgan at St. James on 18th November 1918. (Moody was born in the Cockermouth Registration district on 9th June 1889). Richard was baptised at St. James on 1st September 1920. All available evidence is that he was unmarried, and no brothers or sisters have been traced. At baptism the family home was 35 Queen Street. Lieutenant Stanley T. Park (Service No. 72565) of the Border Regiment died on 3rd June 1947, aged 29. He was the eldest of three sons of Mr and Mrs William Thomas Park and the husband of Nancy Lena Park, of Carlisle and is buried at Wreay (St. Mary) Church Cemetery, St. Cuthbert Without, Cumbria. From his School records we know that he was born on 17th July 1917, the family lived at Kimpston House, Whitehaven, his father was a Bank Manager and his primary education was at Ghyll Bank School, Inkerman Terrace (until going to Grammar School in September 1929). After leaving the Grammar School (apparently without passing exams) in July 1933 his further education was at St. Peter’s College, York. His brothers were John and Joe. The marriage had been in the June quarter of 1942 in the Cockermouth area. They lived at Rosehill, Moresby after marriage, but his widow moved to 3 Towers Lane, Cockermouth. They had one child- Patricia Ann who had been born on 17th January 1944. Nancy did not remarry and died at Blackpool in October 2004. His sword and swagger stick was sold at Mitchells Auctions in June 2008 (Lot 560). He is also commemorated on the Grammar School Memorial (now on the South Gallery of St. James Church) and on Cockermouth War Memorial. Lance Corporal Gilbert E. Pearson (3607258) of the 2nd Battalion Border Regiment died on 5th June 1944, aged 27. He is buried at Imphal War Cemetery, India in Grave I B 4. Imphal is near the Burmese border, and around 1,600 men are buried here. He had served his time as a joiner with Metcalf’s, and had worked on the new Hensingham Estates (for Whitehaven Borough Council) before joining up. He was one of three sons of Ernest and Margaret Pearson (of 9 Scotch Street), and was both a pal and a workmate of John Richardson (next entry), who died on the same day and at the same place, and is buried in the adjacent grave. His brothers were Ralph and John. A joint memorial service for Pearson and Richardson was held at St. Nicholas Church on 25th June 1944. Lance Sergeant John Richardson (3607262) of 2nd Battalion Border Regiment died accidentally in Burma on 5th June 1944, aged 27. He is buried at Imphal War Cemetery, India in Grave I B5. He worked on the new Hensingham Estates (for Whitehaven Borough Council) before joining up in August 1941, and had gone abroad in June 1942, three months after his marriage (which was not at any of the town Anglican Churches). He had also been a volunteer member of the National Fire Service. He was a founder of the Hensingham Cycling Club, and was both a chorister and bell ringer at Hensingham St. John Church. He was the son of Joseph and Ada Richardson (of Corkickle Lodge) and the husband of Lillian Richardson. The CWGC give Lillian’s address as Hornsey, Middlesex but the family home was 2 Cart Road, Preston Street. They had a child, Robina, who attended Bransty School. There was a memorial service for him at St. Nicholas and Hensingham St. John rang a peal in honour of him. Flight Sergeant Robinson (622736) of the 270 Squadron Royal Air Force, died on 18th December 1943, at the age of 23. He is remembered on Panel 139 of the Runnymede Memorial, Surrey. This commemorates 20,332 airmen with no known grave. He was the son of Thomas and Mary J. Robinson of 85 George Street. He had three brothers and three sisters. He is also on the St. James Memorial. Private Edward E. Shepherd (14658301) of the 2nd Battalion, The Kings Regiment (Liverpool) died at Fusehill Military Hospital (Carlisle) on 2nd January 1946, aged 37. He was buried at Whitehaven Cemetery (from St. Nicholas) on 5th January 1946 in grave 6E69, by the Vicar of Hensingham. As this area is Roman Catholic/Nonconformist his denomination is therefore unclear. He apprenticed as a printer with Mr Burlington. In 1939 he had joined the Whitehaven News as a compositor. He was also an instructor at a Whitehaven gymnasium and a member of the YMCA gym team. In 1941 he became an instructor to the Egremont flight of the Air Training Corps, and joined the army in late 1943. He was seriously wounded in fighting in Italy. Internal troubles developed, and he was invalided home. In late 1945 he was admitted to Fusehill Hospital for tests, but the death was unexpected. He was the husband of Maggie Shepherd (nee Bowes) whom he had married on 8th April 1939 at St. James’ Church, at the age of 31 (and Maggie was 29).. At the date of marriage his address was Brook Cottage, Hensingham and hers was 15 Brackenthwaite- this became the family home. There were no children. He had enlisted on 5th July 1944. He was one of 4 sons of Mr J. Shepherd (his mother predeceased him). Lance Corporal Robert Stables (7882897) of the 7th Royal Tank Regiment, Royal Armoured Corps died on 6th December 1942, aged 30. He was buried in Grave III A 13 at Ancona War Cemetery, Italy. He was the son of William and Margaret Ann Stables, and the husband of Josephine Stables. He is not on the Borough Roll of Honour, but lived at 28 Church Street. They had a son, Ronald born 18th May 1941. Sergeant (Air Gunner) Robert Thomas (1681745) of the Royal Air Force Volunteer Reserve died on 18th December 1944, aged 20. He was buried in Grave I C4 at Venray War Cemetery, Netherlands. There are 692 men buried here. The cemetery is about 40 km east of Eindhoven. He was the son of Robert and Mary Clelland Thomas, and the husband of Lilian Thomas of Kells. They were living at 136 Queen Street. Sergeant Todhunter (1523611) of the Royal Air Force Volunteer Reserve (based at Lossiemouth, Scotland) died in an Air Crash aged 22 on 14th August 1944. He was buried on 19th August at Whitehaven Cemetery in Grave 5 / P / 10 (from St. Nicholas), together with his mother who died on 15th October 1944, aged 63. His father died on 10th March 1941 (aged 62), and was also buried in 5/ P / 10 on 14th March 1941 from Holy Trinity Church. He was the 6th son/ 8th Child of George and Jane Todhunter (nee Beck) who lived at 14 Solway View at the date of Harold’s death. George was the innkeeper at the Indian King Hotel on Roper Street. His parents had married at Holy Trinity on 3rd February 1902. George was then a miner of Tangier Street (father, John was a Barber) and Jane’s father was a Ship’s Plater of Albion Street. At the 1901 census George and his brothers John, Edward, Henry and Alexander were living with their older sister Lilian and her two children while John was living on his own at 105 Main Street, Parton. From School Records we know that he was born on 20th January 1922 (and baptised 19th February 1922 at Holy Trinity). He was on a 100% County Council ‘Article 15’ grant, having previously attended St. James C of E School. He passed the JMB School Certificate in 1938 in the Lower 6th form. At School he was the Captain of both the Rugby and Cricket teams, later playing for the town teams in both sports. He worked at Whitehaven Laundry as a Clerk, then in the offices at High Duty Alloys. Older brothers and sisters (all baptised at Holy Trinity) were William (born 1904) and John (born 1905) both at 5 Williamson’s Lane; Martin Beck (1907) and Lillian (1909) both at 4 Torrentine’s Lane; Alexander (1913), Margery (1914) and Leonard (1917) at 32 Strand Street, as was Harold. Interestingly George’s brother Henry was also an Innkeeper for many years and also had a large family. Lossiemouth (built in 1938/1939) was mainly a training base for 20 Operational Training Unit (Training on Wellington night bombers) although occasional operations were undertaken from there, like 617 (Dambuster) Squadron’s raid on the Tirpitz a few months later. By 1944 it was part of 91 Training Group. It should be possible to find out the details of the accident by visiting the National Archives at Kew and studying document AIR 29/664. He is also commemorated on the Whitehaven Grammar School memorial (which he attended between September 1933 and June 1939), now on the South Gallery of St. James Church. Lieutenant Clifford R. Williams (72170) of the Nottinghamshire Yeomanry, Royal Armoured Corps died on 26th March 1943 aged 43. He had joined the 5th Border Territorial Battalion in 1936 and became an instructor at the Carlisle Infantry Training Centre. He then became the Small Arms Officer at Battalion HQ, and was then seconded to the Royal Armoured Corps (as a Temporary Captain). He reverted to the rank of lieutenant on leaving for Tunisia in August 1942. Lieutenant Williams died commanding three tanks at the El Hamma attacks with the 8th Army. He has no known grave, but is commemorated on Face 5 of the Medjez-El-Bab Memorial, Tunisia. He was the only son of John Roger and Sarah Helen Williams (of Shrublands, Corkickle) and the husband of Mary Williams (nee Peel). They married on 7th October 1939 at Hensingham St. John and set up home at “Hartfield”, Sneckyeat Road, Hensingham and had a daughter (Jennifer Mary born 1st February 1942 , baptised at St. Nicholas on 1st March 1942 and attended Hensingham Infants School). He was educated at Ghyll Bank then the Secondary School. On leaving there he became a pupil in the Mercantile and Commercial Departments at the Whitehaven News, working for his father who was the Manager and Secretary. His father was also the Secretary of the Constituency Liberal Association. He is also on the Whitehaven Grammar School Memorial.